Remember we mentioned that STI is at Critical support, when STI was at 3119 we warned about the >100point drop in overall market. Once again we get the big move right on the market. I am glad that we have informed all our client to reduce holdings before the drop. If you still not our client, you should seriously think about it. Since opening a trading account is Free and for the extra service we provide is really awesome. If you are interested to open a trading account pls drop me a message here. 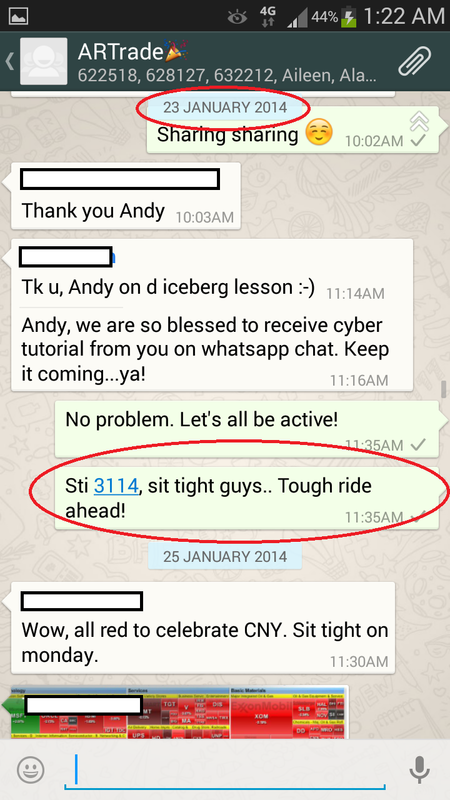 The above chat group is our Students discussion group, we mention all to sit tight when STI break the support at 3114. If you want to know more about our program for full time trader, pls drop me a message here.